​While Big Sky was tied securely in the Monastir, Tunisia marina we joined up with friends for a guided trip south into the Sahara Desert. With a hired car and driver seven of us we set off from the coast for an unforgettable four-day journey through Tunisia south and then west into the Sahara Desert as far as Algeria and then back to the coast. The Sahara is the world’s largest desert and occupies 1/3 of the continent of Africa, from Morocco to the Red Sea. Tunisia is one of 11 countries the desert resides in and has the smallest portion of the desert but it’s the most accessible for infrastructure and safety. It's a red seemingly endless ocean of sand. Safety is paramount to Tunisia's tourism, and they never allow tourists to jump on a dromedary (one-hump camel) without first reporting to the National Guard. Proper clothes is a given (sun screen, hats, skin/face cover and large cotton scarves that cover from head to foot, shoes to protect from scorpions, AND, lots of water). Wildlife is scarce, except for a desert fox, a gazelle, lizards, poisonous adders and scorpions. Following the Atlas Mountain range we traveled south with our first stop in El Jem, a 3rd century, 3rd largest Roman amphitheater and the best preserved Roman relic. It housed 30,000 spectators in its day and entertainment was sending in prisoners for their one-last chance at freedom by wrestling wild beasts. If they won, they were declared Gladiators. El Jem was at that time, the richest town in Roman Africa. As we drove further south, the terrain changed from endless olive groves and green fields, to rocky outcrops, red sand, to silkier pinkish sand, and then to an endless sea of hot beautiful wind-carved sand. Stopping in Matmata, we were invited into the age-old, odd lifestyle of the Berbers, the indigenous (non-Arab) people of North Africa. They’ve roamed the area as nomads since 4000 BC, making up a very small population of Tunisian's 10 million people. Tunisian’s are Muslim and 98 percent Arab the rest are Jews and Christians and the smallest group are the Berbers. 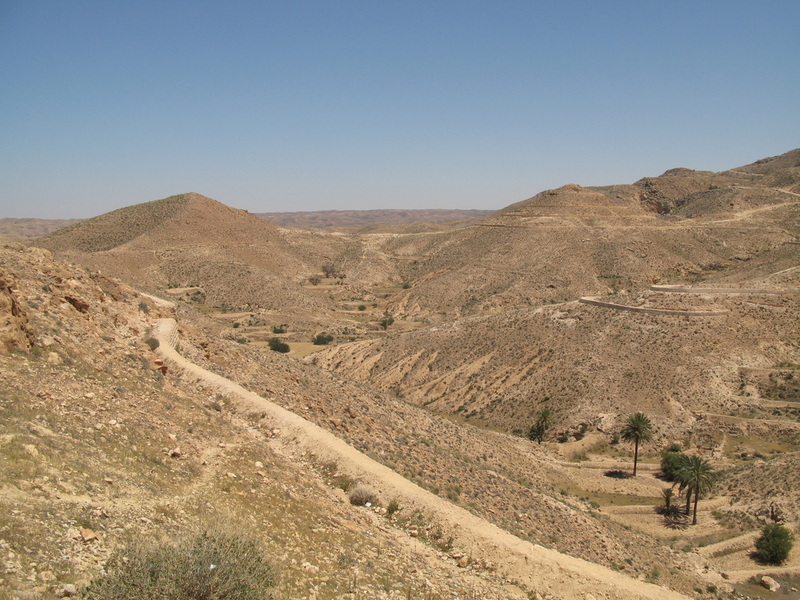 The Berber village in Matmata is the largest known. It's where houses are dug out of rocks. The people seek the coolness and shelter the rocks can provide and they can cool their houses to 17 C, a feat in the heat of the Sahara. We were invited in, for the price of a dinar coin. The house above looks like a concealed hole in the hillside and its opening leads to bedrooms, kitchen, and simple rooms. The centre is a courtyard. In 2009, the constitutional republic Tunisian elected president banned the wearing of religious wear in public in a progressive stand to keep the Islamic religion personal and not political. Tunisia won their independence from France in 1956 and elected their first president on a five-year term. Their constitution will not allow a religious party to rule, hence the separation of politics and religion. NOTE: Since our visit Arab Spring began, many of these new progressive changes have reverted negatively. We drove to Douz, the “Gateway to the Desert” and where the road ended. Any further east requires a dromedary and that’s what we did. You must sign in, and when you return sign out, to make sure nobody is left in the raw Sahara elements. Everyone was required to wear a head scarf to protect our brains from the sun, sun screen to exposed face, and long robes covering our skin. The dromedary’s were accommodating, kneeling patiently until we were settled, and lifting upright creating a dramatic tilt. Hold on! They call out a sound that to me seems like a complaint. The guide walked ahead its rein. Moving along to El Faovar, we spent our first night in a simple hotel fed by a 3,000 meter deep artisan well. The town is an oasis on the southern shore of the Chott el-Jerid “Salt Lake”. Everywhere we looked, the landscape was sand and desert, reminding me of the Saskatchewan summer fields. In the morning, we set off east across the Chott el-Jerid passing shallow pools of water that took on a variety of bright colours, mostly reds and pinks. This area sparkles with the glittering salt that stretches as far as you can see. All along our trip we continually saw mirages, reflection of the salt. Driving on, we arrived that afternoon in the oasis town of Nefta. A horse-drawn buggy was prearranged for us to tour the town and palm orchard. The biggest problem was nobody spoke English and the arranged guide for that area only spoke Spanish. I tried my hardest to translate, probably understanding less than a third of what was said. Continuing through the Oasis, our next stop was Tamerza, known as the “hanging balcony” over the desert. It was stunning to see so much water in a desert, and hear the sounds of frogs chirping. This is the sight for many scenes in the movie The English Patient. You’ll find up-scale hotels in this area, which seemed wrong, since the resources required were so necessary for other types of life in the region. We drove further to the set of the Star Wars movies, passing a desert fox on the sandy trail. Our guide drove on to Chebika, Tamerza and Mides, passing herds of dromedaries led by herders. Midas is right on the Algerian border, our furthest eastern point on this journey. Wonderful fruits can be grown in the oasis, like pomegranates, citrus and of course the dates from the palm trees. Stopping in Gafsa, we viewed the striking ancient palaces. Our last stop was Kairouan, the holiest city in Tunisia and home the Great Mosque and then our return to Big Sky feeling satisfied that we had a great trip.